What's in Samsung's Galaxy S8 and S8+ smartphones? Samsung's new Galaxy S8 and S8+ smartphones look beautiful, and are loaded with new features that could make an upgrade worthwhile. The handsets are superfast and 4K capable, and also herald the arrival of new technologies like Bluetooth 5 and LTE gigabit modems. We take a look inside the handsets and see how they have improved from the Samsung Galaxy S7. The Galaxy S8 has a 5.8-inch screen, while the S8+ has a 6.2-inch screen, which are larger than the 5.5-inch S7 and the 5.7-inch Note 7. The screen resolution is 2960 x 1440 pixels, a slight uptick from S7's 2560 x 1440-pixel screen. Samsung was able to increase the S8 screen size by cutting the home button, and also adding to the height. The screen area now constitutes 83 percent of the S8 front surfaces. At 155 grams, the S8 is two grams lighter than the S7. The S8 is 8 millimeters thick, while the S7 is 7.9 millimeters thick. The S8+ is 8.1 millimeters thick. In the U.S., the Galaxy S8 and S8+ will have the eight-core Qualcomm Snapdragon 835, while in other regions the phones will have Samsung's homegrown eight-core Exynos 8895. On paper, the chips are competitive and you should notice little difference in performance. The chips are made on the latest 10-nanometer process, and on average about 20 percent faster performance and 40 percent more power efficient than chips in the Galaxy S7. The smartphones will be great to use with the Gear VR headset. The Galaxy S8 and S8+ will be capable of shooting and playing 4K video at 120 frames per second via an external monitor. Qualcomm has said its Adreno 540 GPU in the S8 is about 25 percent faster than the Adreno 530 in the Galaxy S7. The Mali G71 GPU in Galaxy S8 is about 20 than its predecessor in the S7. The chips have custom features to speed up multimedia playback and VR, but the Adreno 540 holds an advantage over the Mali GPU. 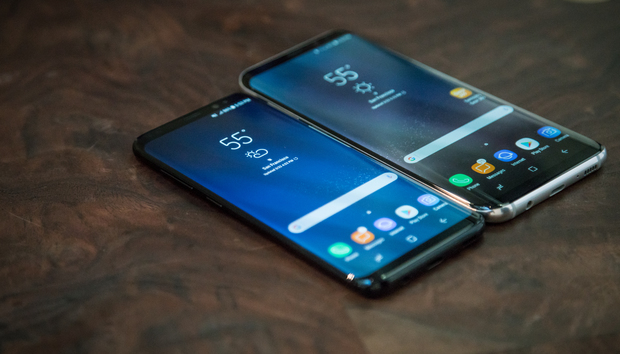 The S8 and S8+ have LTE modems than can achieve download speeds of up to 1Gbps, which is faster than most home wired Internet connections. However, cellular networks offer much lower download speeds and are not ready for those blazing modems yet. The S7 had an LTE modem will download speeds of up to 600Mbps and upload speeds of up to 150Mbps. Samsung executives stressed they had learned lessons from the fiasco in which Note 7 batteries exploded, and had implemented rigorous battery-testing processes. Only time will tell if the changes have worked. The S8 has a 3,000 mAh battery, which is similar to the S7. Being a larger phone, the S8+ has a 3,500 mAh battery. The S8 smartphones will be among the first handsets with Bluetooth 5. The new wireless protocol will allow S8 smartphones to communicate with devices like wireless speakers at longer distances and faster speeds. With a range of well over 100 meters, Bluetooth 5 has four times the range of Bluetooth 4.2. In theory, devices with Bluetooth 5 can transfer data at 2Mbps, twice that of Bluetooth 4.2, but chipset makers like Nordic Semiconductor recently said they aren't yet hitting full speeds. The S8 smartphones have 12-megapixel rear cameras, similar to the S7, and 8-megapixel front cameras, an upgrade from the 5-megapixel equivalent in the S7. The S8 handsets have 4GB of memory, 64GB of storage, 802.11ac Wi-Fi and GPS, similar to the S7.